A videogame collector got way more than he bargained for after picking up a couple of NES cartridges at a Georgia flea market, as first pointed out by Kotaku. On the surface, Julian Turner thought he had snagged a copy of Golf and a PAL version of Rollergames from the West Georgia Flea Market, but, after further investigation, he discovered that two carts housed an amount of drugs valued at “easily five figures” by the Newnan Police Department. Suspicion first arose when the two cartridges felt heavier than Turner’s others. During a YouTube video depicting Turner running through his latest additions to his collection, Turner weighed both games against other copies of the same games. Both cartridges weighed roughly 50 percent more than they should. Turner subsequently removed the casing of each game, while jokingly mentioning rumors of Famicom cartridges being used to smuggle items in the past, revealing four square, silver packages within. Using a boxcutter, Turner cut into one of the packages, revealing a brown substance inside. Turner revealed in the video that “anonymous experts” informed him that the contents appeared to be heroin and the police stated it was “synthetic.” Turner immediately called the Newnan Police Department, who questioned both Turner and the flea market vendor before confirming that the drugs had been inside the cartridges for an extended amount of time. The police have yet to identify the substance. Both games are over 30 years old, meaning these packages could be from the drug-filled heyday of the ‘80s, a lasting remnant of the decadence of an era gone by, though the synthetic nature of the drugs means they are more than likely younger. Turner also pointed out in the video that the Rollergames cartridge was specifically modified to hold the packages. The whole experience was unsurprisingly bewildering, but it did lead Turner down a NES smuggling rabbit hole that led to the discovery of another case in which $5,000 in cash was found inside a copy of Golf, with bills dating back to 1985. 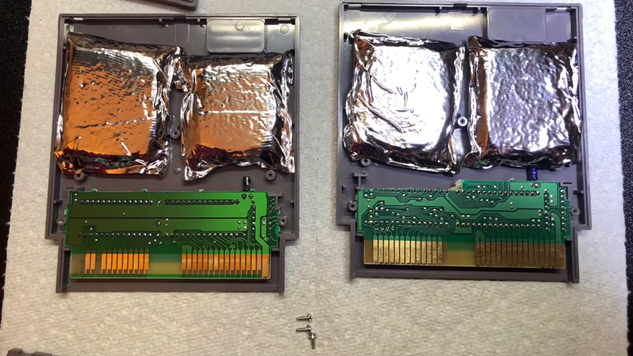 Maybe we should all double check our NES carts, you know, just in case. If drugs and cash were lurking inside a copy of Golf, imagine what could be lurking in that copy of Golgo 13 on your shelf. Check out Turner’s entire video below.